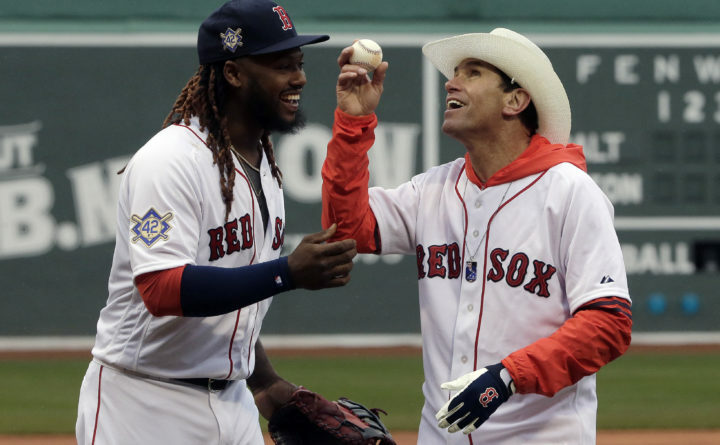 BOSTON — Andrew Benintendi got three hits and the Boston Red Sox extended the best start in their 118-year history, beating the Baltimore Orioles 3-1 Sunday at frigid Fenway Park. Mitch Moreland also had three hits for the Red Sox, who completed a three-game sweep of the shortened series and improved to a major league-best 13-2 under new manager Alex Cora. The series was supposed to last four games, but the traditional Patriots’ Day game scheduled for Monday morning at 11:05 a.m. was postponed late Sunday afternoon due to a forecast that calls for heavy rain throughout the day. The game will be made up May 17. It is the first time the Patriots’ Day game in Boston has been postponed since 1984. Players on both teams wore extra layers, many with neck wraps or head shells, and the usually-nearly-packed Fenway was less than half-full in conditions that made it feel more like a New England Patriots’ home game mid-December. The Red Sox posted an announcement offering free hot chocolate to the fans from the middle of the fifth inning on. Boston ace Chris Sale gave up one run on two hits in five innings, striking eight and walking two. Trailing 1-0 in the fifth, the Red Sox tied it against Dylan Bundy (0-2) on Benintendi’s RBI triple. They went ahead the next inning when J.D. Martinez scored on a wild pitch after reaching on third baseman Danny Valencia’s fielding error and advancing on Moreland’s double. Tzu-Wei Lin’s RBI double made it 3-1. Pitching in short sleeves with a game-time temperature of 34 degrees and a wild chill in the mid-20s, the lanky Sale gave up hits to two of first three batters of the game when Trey Mancini reached on an infield hit and scored on Machado’s double. Bundy gave up three runs — one earned — on seven hits in 5 2/3 innings with six strikeouts, two walks and two wild pitches. Red Sox: Cora gave OF Mookie Betts the day off after he bruised his left foot sliding into the plate and colliding with Baltimore catcher Chance Sisco’s shin guard. There was a moment of silence commemorating the fifth anniversary of the Boston Marathon bombings. Two bombs went off near the finish line less than an hour after the Red Sox completed their annual Patriots’ Day game on April 15, 2013. Cora said he never considered not pitching Sale in the conditions because the lefty had worked in the cold when he was with the White Sox. “I think it’s tough to play anybody in these conditions,” Cora said. “Somebody that’s capable of doing it is him — he played in Chicago. Red Sox: LHP David Price (1-1, 2.40) pitches the opener of a nine-game road trip Tuesday against the Los Angeles Angels. Price left his last start Wednesday after feeling a “sensation” in his throwing hand.